← Did Jesus Christ visit England? The Red Squirrel Fightback begins! It is one of our most loved creatures and like the Robin redbreast is one of our most treasured creatures. Symbolised in snowy British winters it is iconic and yet like most of us, I’ve never seen a Red Squirrel. 150 years ago they were rampant across much of the nation but then in 1876 in Henbury Park in Chester North American Grey Squirrels were released as an exotic attraction and within 30 years they had spread for hundreds of miles in each direction. 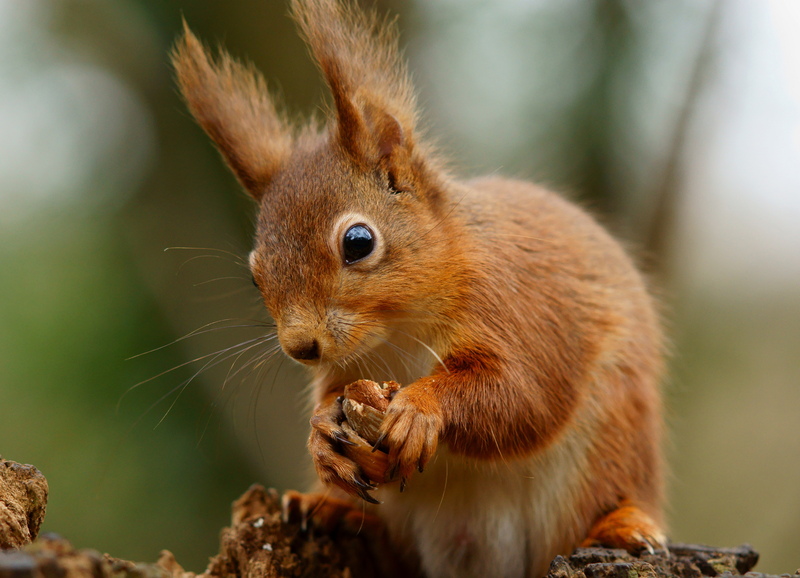 Since 1950 the Red Squirrel population in Great Britain has declined by 95% and they have become confined to isolated areas on off-shore islands and isolated highland forests. There are several reasons for the decline of Red Squirrels whose numbers may well have been falling before the introduction of the Greys due to the loss of their natural broad leaf woodlands. The North American Grey Squirrel is larger and heavier than the Reds and though they don’t attack Red Squirrels they are able to out compete Reds for food and their higher fat levels make them more adaptable to cold winters. Most significantly of all the Greys carry Squirrel Pox which they are immune to but which Red Squirrels have no defence for and when the Greys come into contact with the Reds then the Reds tend to die out very quickly which leaves the local habitat more open to Grey occupation. Many if not most people now see Grey Squirrels as an unwanted alien species who since the 1920’s have been condemned as a pest or vermin that damage our trees and their ability to destroy the nests and eggs of many of our birds but for most of the last 100 years it has seemed like the squirrel population was only going one way, from Red to Grey which leaves us in the situation today where there are 66 Grey Squirrels for every 1 Red Squirrel. Recently though there have appeared reasons for optimism for lovers of the endangered Reds. Mirroring the re-introduction of lost species of wildlife such as eagles, beavers and boars a coordinated decision has been made to not just protect the Reds but to actively reduce the numbers of Greys. Whereas before individuals would cull Grey Squirrels, the temporarily vacant habitat would soon be re-populated by the Greys. Now though an altogether grander movement is underway. In many areas Grey Squirrels are now been trapped or shot on sight. Understandably, especially at first, many people were against or even shocked at such a policy against an animal that had been here beyond living memory and which for them seemed entirely natural. However this hasn’t stopped the culling continuing and those who take part are becoming increasing ardent about doing so. Often the Greys are not killed just for environmental reasons but their meat has become a delicacy in some of the finest restaurants from London to Edinburgh and rural butchers and pubs are almost as likely to be selling squirrel alongside other game such as Venison, Rabbit or Partridge. But is all of this having an effect? The answer is yes. The seemingly irreversible onward march of the Greys has been halted and Reds are being sighted for the first time for decades in parts of Yorkshire and North Wales where Reds have broken out of their last Welsh stronghold on Anglesey (following a controversial 20 year cull to eradicate Greys from the large island) and crossed the Menai Bridge to establish colonies on the mainland. 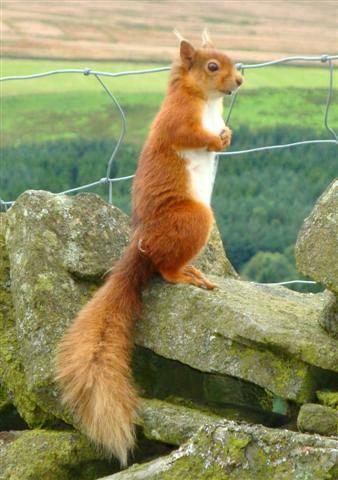 Red Squirrels are even being spotted in towns such as one recently in Windermere where none had been seen for 16 years. Obviously if individual farmers and hunters can bag 50 or 60 squirrels over a few months it will make a difference locally but the real breakthrough may be down to nature itself. 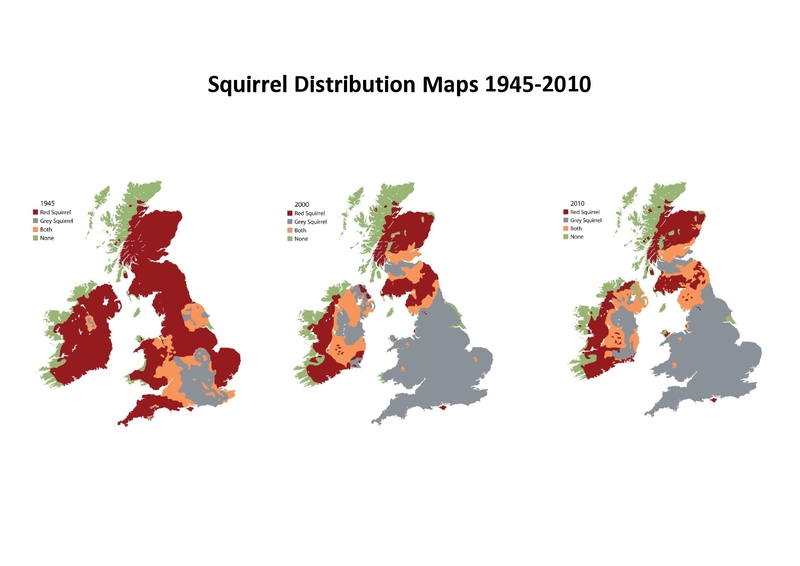 It is being quite widely reported that Red Squirrels themselves are developing natural immunity to Squirrel Pox, something which has taken them 140 years and countless generations. The first reports of this happening started occurring 5-10 years ago but it is becoming more widespread. Recent surveys in 300 woods indicate that the Reds population have increased by 7% and the Greys have fallen and environmentalists have had the opportunity to witness the increasing Reds resistance to Squirrel Pox. Rachel Miller, Red Squirrel field officer at the Wildlife Trust for Lancashire and North Merseyside, said: “It could be a few years down the line until we know for sure if red squirrels have any long-term immunity or not, as there is much more research that needs to be done. But this squirrel survived the pox, which is great news. “We named him Clark, after Superman’s ‘Clark Kent’, because he’s a super squirrel. We don’t know why he survived, but something made him resistant to the pox. 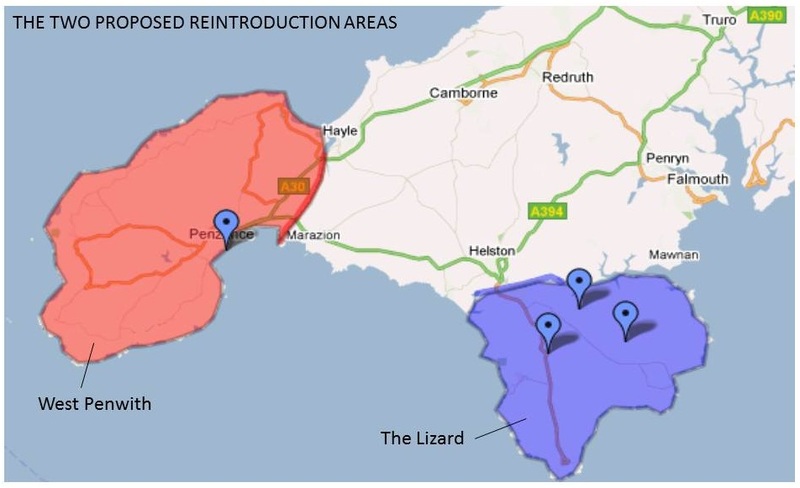 Efforts are now underway to establish new colonies of Red Squirrels in southern parts of England including in Norfolk and the Thetford Forest area and in Cornwall where areas that are surrounded by sea on 3 sides are being cleared of Greys in preparation for the re-introduction of the native Reds. It may take a century or more but it appears that the groundwork has been laid for the Reds to flourish more widely across the country. Whether ridding the entire country of Greys is possible or even desirable is another matter as Reds are more specialised feeders that require continuous woodland rather than the smaller areas prevalent in much of the country. It’s not often that we’re able to undo a giant if unforeseeable mistake and as other countries are now in the process of tackling their own invasive species problems then I think we should do the same too. Often visitors on my tours around London remark on how adorable our Grey squirrels are compared to their species at home, well the Red Squirrels are undeniably much cuter still and maybe that will be the factor that helps them secure their future. 1. Killer Shrimp which kills both native shrimps and large numbers of invertebrates. These have currently been restricted to three sites and as an eradication programme is worked on, the danger is they may spread on the underside of boats. 2. Water Primrose, a plant that has been sold in garden centres can grow and spread itself over vast areas making a healthy waterway a stagnant, lifeless area in a short period of time as has occurred in many places in France and Belgium. 3. Floating Pennywort, another plant that covers the surface of water and destroying the habitat of native species. Only introduced in the 1980’s it is already costing about £1 million a year to combat. 4. American Signal Crayfish are much larger and more aggressive than the native species which are now seriously endangered. Like the Grey squirrels, the Crayfish also carry a bacteria which is deadly to native species and an accidental introduction from eggs carried on the sole of wellington boots can transform a diverse habitat into a mono-species hell hole. 6. Giant Hogweed was introduced as an ornamental garden plant in 1893 but since escaped. It’s leaves can cause irritation if touched but worse than that is the rampant growth they’ve made along river banks which kills of native species allowing the banks to erode away and become very susceptible to flooding. 7. Japanese Knotweed is notoriously difficult to eradicate and its ability to shoot up through concrete and cement means it is a danger to humans as well as wildlife. It has become such a problem that government agencies are now using biological agents to halt its spread and reduce the material damage it causes of £150 million a year. 8. Himalayan Balsam is a pest that we’ve probably all seen on roadsides and wasteland, it grows 3 metres tall and produces purple-pink flowers from June onwards. However it takes over the habitat of native grasses and flowers reducing bio diversity as it does so and effecting the integrity of riverbanks. It is primarily being tackled by teams of volunteers who remove each plant by hand. 9. Parrots Feather is a South American plant introduced for Aquariums. It grows densely and removes lights and oxygen from the water below which effectively sterilises the waters at 150 sites across the country. It is so dense that young children are tempted to walk on it. 10. North American Mink were brought to the UK for fur farms but escaped in the 1950’s. They eat fish, birds, poultry and small mammals such as the protected water vole. They are trapped and destroyed when populations are identified. I am a writer and traveller with a penchant for history and getting off the beaten track. With several books to my name including a #1 seller, I also write environmental, travel and history articles for magazines as well as freelance work. Recently I've appeared on BBC Radio and Bloomberg TV and am waiting on the filming of a ghost story on British TV. I run my own private UK tours company (Ye Olde England Tours) with small, private and totally customisable guided tours run by myself! This entry was posted in Life, Northumberland and Durham, Travel and tagged birds, Environment, Grey Squirrels, Invasive Species, Life, Maps, Nature, northumbria, outdoors, Red Squirrels, Squirrels, wildlife, Woods. Bookmark the permalink. 8 Responses to The Red Squirrel Fightback begins! red or rather dark red squirrels are the only ones we see in our part of italy tuscany. they are as you say much cuter than those greys. North America has combated several non-native species of plants and animals, but I didn’t appreciate that our species were invading other places. Long live the Red Squirrel! Yes, let’s hope they make it! Very interesting to get the other side of the invasive species issue. As well as the grays, we in the States have our own species of red squirrel, which at least for me has always been a special sighting, as opposed to the grays, which are everywhere. I think in this case it has more to do with habitat; like you said, habitat fragmentation has an important effect, probably as great as any invasive species issues. My two most hated invasives are garlic mustard, which crowds out native wildflowers, and starlings. I actually have no idea what would happen if we made a serious effort to eradicate starlings here. It might be impossible. The story of their introduction to North America is a blog post in itself. Starlings are a natural species here, I think there are several varieties across much of the world but not the ones in North America. Even over here Starlings are quite aggressive birds going round in packs and when they come to the feeders I have in my garden at first they scare off the other birds and then they fight amongst themselves even when there is plenty of space and food to go round! The only place I’ve ever seen a Red Squirrel in the wild was crossing the road in front of the car we were driving in through a patch of forest near Heidelberg in Germany.